Some of music's biggest songs have come about when artists are pressured to deliver a hit single. Pop history is littered with numerous examples of one more song being written for an album - and that hastily added track going on to be massive. This week in 1984, the final song completed for a soon-to-be-huge album (at the behest of the singer's manager) debuted on the ARIA singles chart. It would end up as the year's number 1 song... without ever reaching the top of the chart. At the top of the chart this week in 1984, "Hello" by Lionel Richie took over from "Footloose" as Australia's most popular song. It was the first of a three-week run at number 1. Another big hit in the US, another flop in Australia from JCM's Uh-huh album. John would get his local chart career back on track with 1985's Scarecrow album. A year-and-a-half after he topped the chart with Jennifer Warnes, Joe Cocker peaked 50 places lower with the lead single and title track of Civilized Man. Not to be confused with Thompson Twins (who jumped up to number 27 this week), this German synthpop act was actually comprised of two people: singer Ronny Schreinzer and keyboardist Sven Dohrow. They weren't, however, related, but got their name from the fact that they were dressed and styled similarly in an early photo shoot. Taken from the duo's third album, A Wild Romance, "Not The Loving Kind" doesn't appear to have been a hit at home in Germany - although two other tracks from the album were. After the disappointing chart performance of "Magic", Dragon rallied and delivered yet another solid pop/rock track ahead of their Body And The Beat album, which would debut in the top 10 in a few weeks. "Cry" at least returned them to the top 20 of the singles chart but I can't quite work out why the band's songs weren't being better received. Perhaps number 2 smash "Rain" was proving too big a hit to live up to. Like Dragon, Eurogliders were up to their third single from their (just-released) new album, This Island - but in this case it was "Heaven (Must Be There)" that would give them their number 2 hit after the LP's two previous singles hadn't even dented the top 50. The sound of a band hitting their stride, "Heaven..." built from its subdued verses to explode into one of the year's catchiest choruses. And while Eurogliders would never better this chart peak, they did, unlike Dragon, have a couple more top 10 hits to come. If at the start of 1984, you'd tried to predict who would turn out to be one of the year's biggest artists, you probably wouldn't have named the man who'd only ever enjoyed two minor top 40 hits (five years apart) in his already lengthy music career. Even in the US, Bruce Springsteen had only had one top 10 hit up until this point - 1980's "Hungry Heart" (number 33 here). But that was exactly why his manager, Jon Landau, pushed him for one last song to add to his upcoming album, Born In The U.S.A. Yes, Bruce did just fine on the live circuit and sold albums - his last four had gone top 10 in Australia - but a massive hit single would turn him into a true superstar. 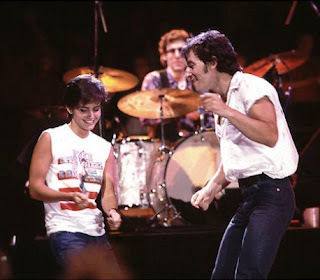 And so Bruce wrote "Dancing In The Dark"... about the challenge of writing a "hit single" and it became a monster. A textbook case of a slow burn, "Dancing In The Dark" didn't reach the top 10 until its 11th week on the top 100 in mid-August. Then, it didn't make it to its final peak of number 5 until its 17th week in late September. It was still in the top 10 in early November and, thanks to a second wind in early 1985 when B-side "Pink Cadillac" was given double A-side status, didn't exit the top 50 until a year after it entered. 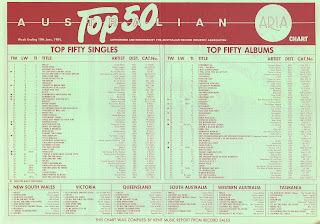 Despite never progressing higher than number 5, its consistent chart performance resulted in it being crowned 1984's number 1 song. So why was "Dancing In The Dark" so popular? Basically, because it's a great pop song. The most upbeat, accessible single he'd ever released - it even featured a synth line - it appealed to people who would never have dreamed of buying a Bruce Springsteen song, while its raw energy kept his existing fans onside. Then there was the Courteney Cox-featuring music video in which Bruce looked like he was having the time of his life - simple but effective. The single was the perfect set-up for Born In The U.S.A., which became his first number 1 album locally (in its 19th week in October) and contained six more hit singles - all of them top 10 hits in the US and top 50 hits in Australia. Two of them ("Cover Me" and the title track) would come and go from the top 50 while "Dancing..." enjoyed its lengthy run, and a third ("I'm On Fire") wasn't far behind it. It's the go-to album for anyone wanting to introduce themselves to reggae and since its release in 1984, the Bob Marley And The Wailers career retrospective Legend has been one of the world's highest sellers of all time. In Australia, it was 1984's 21st biggest album and has been a steady performer ever since, with the odd sales spike over the years. Released as a single to promote the album, "One Love/People Get Ready" was a medley originally recorded by The Wailers in 1965 (as "One Love") that gave proper credit to its use of the Curtis Mayfield-penned "People Get Ready" when it was re-recorded for 1977's Exodus album. 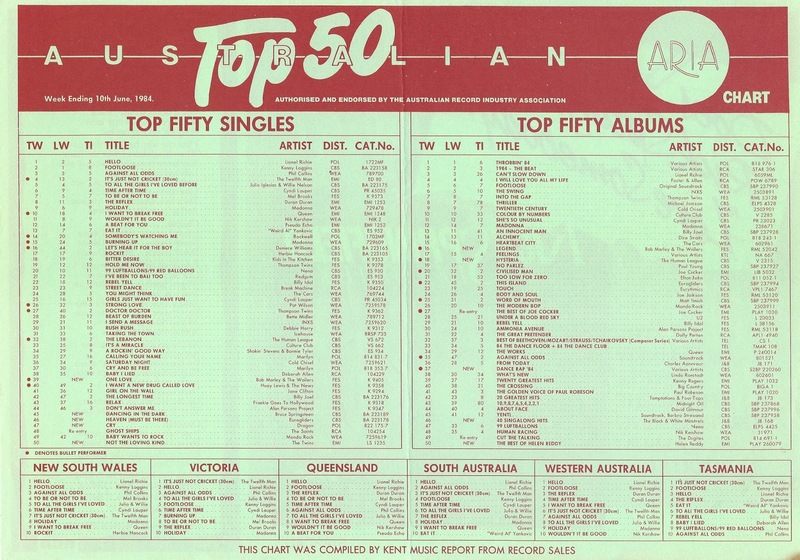 It's the latter version that appears on Legend and gave the group their final top 50 credit in Australia. Next week: the only top 50 appearance by one of my favourite British bands of the '80s, and the first chart hit for a UK act I always thought was American. Plus, the third, fourth and fifth singles from Footloose fall some way short of matching the first two. A while back I added that chart table on The Twins' wikipedia page, so 'Not the Loving Kind' indeed wasn't, to my surprise, a hit in their native country. I have wondered how Gayle & Gillian got to use The Twins as the name of their 'group' without running into legal trouble - esp. given it was only 7 years after this. 'Cry' and 'Magic' were quite decent and seemed like bigger hits than they were. 'Heaven' is good, but I like the verses more than the chorus. Bruce Springsteen, and this song, seemed to epitomise 'America' in my 5-6 year-old mind when this was out. When I'd moved to New Zealand a few months later, it was still getting lots of airplay there, too. 'One Love/People Get Ready' had a 1984 video featuring various celebrities (including Bananarama and Suggs from Madness). Maybe that's why they put The Twins: Gayle & Gillian on the single cover - to differentiate, as well as for name recognition. I remember being stunned when "Dancing in the Dark" was named the #1 song of the year. I didn't realise at the time that the entire chart was pretty much based on a points system (rather than hard sales), but it made sense, given the technology available back then. Billboard still use the points system for all their end-of-year charts (which don't even come out at the end of the year) and for their career-best lists for individual artists. I'd always prefer a sales-based chart.